House Bill 746, which would do away with the need for a concealed carry permit for handguns in most cases, passed the House this week and is headed for the Senate. Lawmakers could kill the bill in the Senate to save GOP colleagues the agony of letting Cooper’s veto stand (and handing him a political victory on an issue most people actually understand rather than something complex and technical). They can try to twist some arms should that veto come and pray there are some Republicans willing to vote for a bill they’ve twice voted against and in some cases made strong arguments against in order to spite Cooper. They can try to fix the bill, making it more palatable to a larger number of GOP lawmakers (Demcorats stood united against it in the House). But how to do that without adding in mandatory firearms training (which would require some sort of permitting system in the first place) isn’t yet clear. Raising the age at which people could carry concealed without a permit from 18 to 21 might move the needle a bit, but conservative sheriffs, police chiefs and law enforcement groups all say they want to see actual training. Meanwhile, the state of the debate — and the seriousness with which some are taking it — can be gauged by this stick figure cartoon, which was making its way around the House floor this week and was shared – among others – by Rep. John Blust (R-Guilford) online as well. Folks who don’t find it that simple include Guilford County Sheriff BJ Barnes, Rockingham County Sheriff Sam Page, Wake County Sheriff Donnie Harrison, all conservative Republicans. 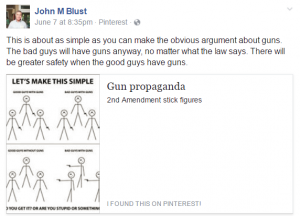 Add to that list the North Carolina Association of Chiefs of Police, the Fraternal Order of Police and Blust’s fellow Guilford County Republican, Rep. John Faircloth (himself a former High Point Chief of Police). They’ve all taken issue with parts of the bill, chiefly the age and training requirements. There’s also the majority of North Carolina voters, as demonstrated by two polls on the issue. NC HB 746 is a good idea that needs adult solutions: TRAINING is the answer….NOT magically turninrg 18!! And who in their right REALLY expects a citizen who simply WANTS to carry a gun to commit to automatic response ALL the legal requirements described in this HB? Our current certification requires a measly 70 % on a Legal Test to become certifed to carry concealed. Now we want to launch a program for 18 year olds (or older) which enables them to carry a gun and potentially use deadly force without reading one word regarding deadly force? 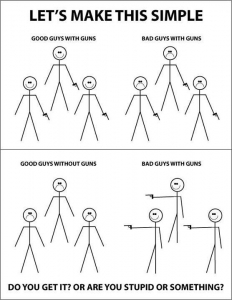 We need to keep what we have (CERTIFICATION of TRAINING), and THEN figure out where Constitutional Carry can fit in.